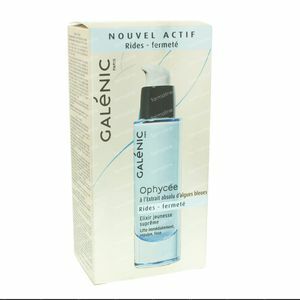 Galénic Ophycée Supreme Youth Elixir 30 ml order online. Galénic Ophycée Supreme Youth Elixir presents you with a light and refreshing textured serum that firms your skin thanks to the glucolipids and soft nourishing emollient esters. 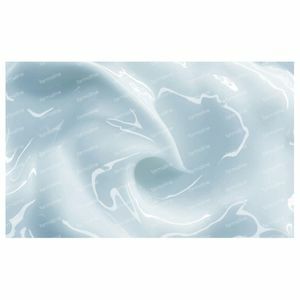 The micro spheres of hyaluronic acid quickly fill out wrinkles and provide deep rehydration for skin with signs of aging, while the blue algea extract boost the collagen and elastin production to firm from the inside out. A powerful hydrating complex has been injected into this product, with the most potent active of the entire Ophycée range for an immediate and long lasting effect. A sefreshing and silky skin firming serum with blue algea extrac to boost collagen and elastin production. Perfect for people with skin showing the signs of aging and wrinkles. - This serum can be used as a three-week treatment during the year, yet for a most long lasting effect it should be used daily as part of your skincare routine. - Apply the serum every morning and/or evening onto freshly cleansed skin, massaging it in with fingertips and followed up with your regular day/night cream. 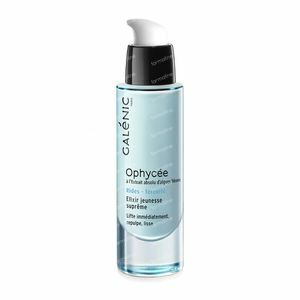 - For an intenser firming and wrinkle smoothing result, it's best to combine this elixir with a Ophycée moisturizer for day or night. WATER (AQUA). GLYCERIN. ISODECYL NEOPENTANOATE. METHYL GLUCETH-20. PROPYLENE GLYCOL DICAPRYLATE/DICAPRATE. TRIETHYLXENANOIN. PEG-12. 1,2-HEXANEDIOL. ACID BLUE 3 (CI 42051). ARACHIDYL ALCOHOL. ARACHIDYL GLUCOSIDE. BEHENYL ALCOHOL. BENZOTRIAZOLYL DODECYL P-CRESOL. BHT. BUTYLENE GLYCOL. CALCIUM LACTATE. CAPRYLYL GLYCOL. CETHYL ALCOHOL. DISODIUM EDTA. ETHYLHEXYL. PALMITATE. FRAGRANCE (PARFUM). GLYCERYL STEARATE. HEXYLENE GLYCOL. HYDROGENATED LECITHIN. MAGNESIUM LACTATE. MALTODEXTRIN. MICA. PEG-100 STEARATE. PHENOXYETHANOL. PHORMIDIUM UNCINATUM EXTRACT. POLYACRYLATE-13. POLYISOBUTENE. POLYSORBATE 20. SILICA. SILICA DIMETHYL SILYLATE. SODIUM ACETATE. SODIUM HYALURONATE. SORBITAN ISOSTEARATE. TITANIUM DIOXIDE (CI 77891). TOCOPHERYL ACETATE.